LODGES, VICE PRESIDENTIAL sections, and individual members that excelled in raising money for CAF and LEF in 2010 received special recognition during the LEAP conference in Washington, D.C., March 21. CAF stands for Campaign Assistance Fund. As the Boilermakers’ political action fund, CAF money goes to support worker-friendly candidates for the U.S. House and Senate. By law, no money from a local lodge treasury or member dues can be used for CAF purposes. Money must be voluntarily donated or come from fundraising activities to be eligible. Only active and retired members, and their immediate families, can contribute to the fund. LEF is used exclusively for election-related purposes and legislative activities. The fund helps influence elections and appointments to federal, state and/or local office, and to offices in political organizations. It is not used for direct contributions to federal candidates. Nearly everything the DGA does is funded through LEF. Without this fund, lodges would get virtually no political or legislative support. Virtually all state and local political expenditures are funded through LEF. In addition, LEF keeps lodges free of federal, state, and local reporting requirements, placing that burden on the International instead. Boilermaker lodges benefit from this fund and are required to contribute to LEF pursuant to a 2006 resolution passed at the Boilermakers’ 32nd Consolidated Convention. THE LEAP CONFERENCE recognized the Northeast Section (IVP Sean Murphy) for the highest CAF contribution by a section in 2010 — $168,036. Local 154, Pittsburgh, garnered the award for largest contribution by a local lodge, raising $56,703. Local 193, (Baltimore), achieved the highest contribution per member at $160 ($37,332 total CAF contribution). Local 69 (Little Rock, Ark.) 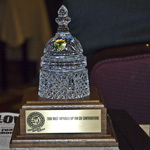 won the award for most improved lodge, raising their CAF contributions by 434 percent in 2010. The Western States Section (IVP J. Tom Baca) won the award for most improved section, increasing their CAF contributions 32 percent, from $92,220 in 2009 to $121,442 in 2010. Retirees contributed a total of $116,631 to CAF in 2010, including $111,553 from the National Pension Trust, and $5,078 from the Officers & Employees Pension Plan. International staff and officers contributed another $50,923. Conference-related contributions and fund-raising activities accounted for $12,620. In all, Boilermakers donated $620,450 to CAF in 2010, with just 74 locals out of 233 participating. Nearly all of the locals forwarding large contributions have included a CAF payroll deduction in their contracts. Payroll deductions are the easiest way to raise money. Most people hardly notice a payroll deduction of $2 a week. Yet donating a couple of dollars a week to CAF can raise more than $100 over a year’s time. To learn how to begin contributing to CAF and how to include a voluntary CAF payroll check-off clause in a contract, call the Government Affairs Department at 202-756-2868 or view p. 39-44 of the new LEAP manual. THE AWARD FOR the highest LEF contribution for a section in 2010 went to the Great Lakes (IVP Larry McManamon), which raised $121,982. Local 83 (Kansas City, Mo.) won the award for the highest contribution by a local, with $42,722. The award for most improved section went to the Western States (IVP J. Tom Baca), increasing their contribution 204 percent, from $23,486 in 2009 to $71,422 in 2010. LEF contributions in 2010 totaled $336,698, with 149 locals out of 233 participating. Total donations made during the conference for LEF was $20,050. Editor’s Note: All donations to CAF and LEF appearing in this article have been rounded to nearest dollar.